As this cake sits in the fridge, the cookies soften to a delicious cakey texture. Giving the kids the components to layer up themselves will keep them busy and having fun for some time! 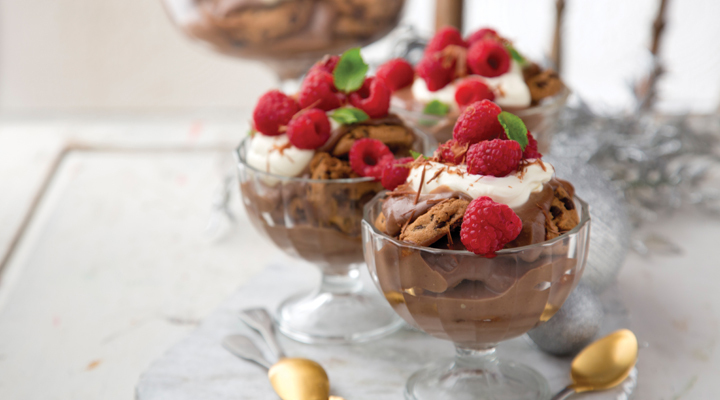 This trifle recipe is based on using packets of SuperValu chocolate chip cookies, which have 12 in each. In case you use a different cookie, you will need 48 cookies in total, each about 5cm diameter. 1. Pour the custard into a pan and break all but one square of the chocolate in. Place over a gentle heat and stir until the chocolate melts. Remove from the heat and leave to cool completely. 2. Place the mascarpone in a really large bowl with the vanilla seeds and beat briefly to soften a little. Pour in the cream and whisk until soft peaks form. This is easiest with an electric mixer or whisk. Fold through the Irish cream liqueur, if using. 3. Spread one-sixth (about 100g) of the cooled custard onto the base of a 20cm-wide trifle bowl that’s at least 14cm deep. Arrange eight of the cookies in an even layer on top. Spread one-sixth (about 160g) of the mascarpone mixture on top in an even layer. Repeat until you have six layers of cookies, finishing with a layer of the creamy mascarpone mixture. Chill in the fridge for at least 8 hours or overnight. This can be prepared up to 24 hours in advance. 4. When ready to serve, finely grate the remaining chocolate over the top. Arrange the fresh fruit in a pile in the centre and go wow your guests! Even if you don’t make this trifle, you must try the two-ingredient chocolate custard included here. The chocolate gives an irresistible twist to the custard and is ideal to serve with a whole host of Christmas treats – or just on its own! Why not scatter the trifle with some festive edible sprinkles from the SugarCraft range, like ‘Deck the Halls’, ‘Snow Drift’, ‘Let It Snow’, ‘O Christmas Tree’, ‘Poppy Red’ or ‘Jingle Bells’? Do this just before serving to avoid any of the colours bleeding into the cream. A fabulous recipe, so simple but oh my lord how scrumptious! I heard Sharon on RTE1 Ray Darcy radio show talking about this recipe and I can't wait to give it a go. Her tip about taking photos with the kids helping with the cooking and creating a scrapbook is also a tradition I'm looking forward to starting this year. Thank you!